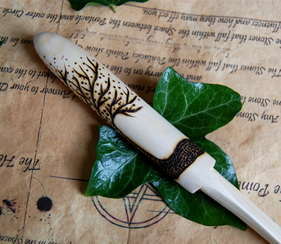 This Beautiful Athame has been Hand Carved by ~Moon Goddess Garden~ from a single piece of Rowan Wood. 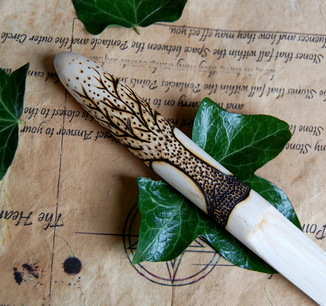 Onto its Hilt we have pyrographed a Tree of Life design with its Roots and Branches encompassing the entire Athame. Rowan is the Witches Tree! Its bright Red berries bare a perfect Pentacle mark at their base and its wood is known for its Magical Protective qualities! Magical Properties include: Healing, Protection, Success, Luck and aids Psychic abilities.